Aside from being absolutely gorgeous – chubby, curvy, large, sensuous and with a beautiful dark green color with a bit of a shine to it – it has a striking flavor that is rich, exuberant and fruity. It tends to be a bit capricious as well: it ranges from the very mild to the very hot. However, there are ways to tame its heat. It is rarely used or cooked in its raw form. Unlike other ingredients, the poblano has to go through a couple of steps to bring out the finest qualities of its flavor, color and texture. It may seem daunting at first, but once you prepare them a couple of times, the process becomes very simple. It is just like preparing roasted red bell peppers. Do you have a recipe for that you put it ona tuna melt. I recently was given 7 pablano chiles and would really like to make chili rellenos w/them. Would u plz give me your recipe? Thank u so much in advance. I love your show! Here is the recipe: http://patijinich.com/2015/04/chiles-rellenos/ Let me know how they turn out! We have tried several of your recipes: Que Bueno! 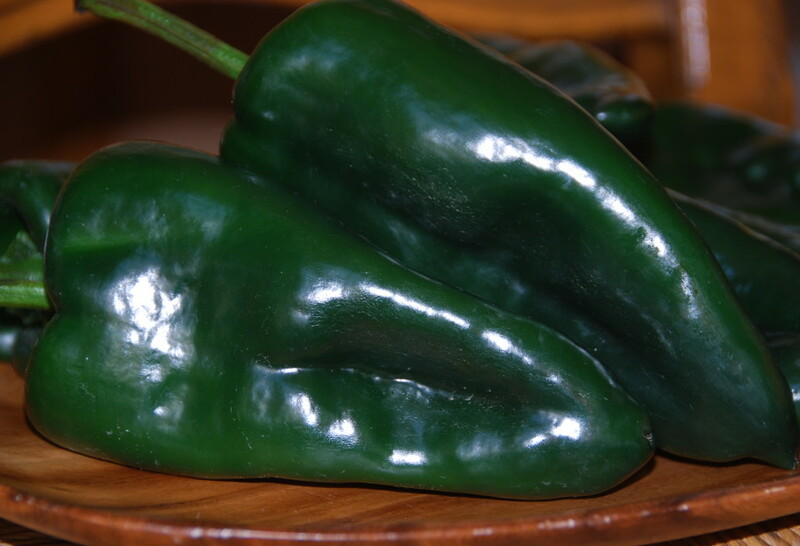 We have tried some of your recipes that call for Poblano chiles. When we go to our Mexican grocers in Fresno, CA, they don’t have Poblano chiles. They carry a fresh green chile that looks like the Poblano chile shown on your show/website under the name Pasilla chile. After much research, including talking with our Mexican Grocer’s Produce Manager’s Mexican wife, we have come to the conclusion that the fresh Pasilla chile sold in Central California is probably the Poblano chile referenced in your recipes. It would be a shame to find out our favorite Patti recipes could taste even better if not for confusing the fresh large green chile sold as Pasilla in our area with a true Poblano chile referenced in your shows. We would like to believe we are experiencing the full flavor of your dishes as intended. Can you give us a little more input on this dilemma? Is there a good alternate pepper if you cannot find pablano’s? We so enjoy your show. Hola Brent, There’s really no substitute for the poblano chile. But, in a pinch, depending on what you’re making, you could try the Anaheim chile in its place…though it will be a different flavor than the poblano. Sure would like to find your pickled pepper recipe. Could you point me in the right direction. my question is, do you have a rajas recipe, or maybe a new spin on them, i have made them before, like my mother used to make. We ate them as our main course dinner, but i would like your opinion on ideas for additions to the meal themselves like a meat or a starch. I watch your show quite often and it remindes me of when I was a child with all the dishes you make that are great Mexican traditions. I am in love with chili rellenos! But for some reason I can’t get the batter quite right. Can you help me? Hola Camila, Of course!! When you make the chile rellenos batter: separate the eggs and beat the egg whites until stiff, then gently fold in the yolks. Before you place the chiles in the batter, dust them with a little all purpose flour so the batter sticks. Viewed your show on TV and really enjoyed the show. I have a question about the main dish you presented. Chicken with garlic,onions,poblano peppers, sunflower and pumkin seeds. When you added the poblano peppers to the chicken did you cook them before added them to the top of the chicken?